Stunning Wain Wath Force is situated on the infant River Swale, set in the beautiful scenery of Swaledale,one of most beautiful dales in the National Park. 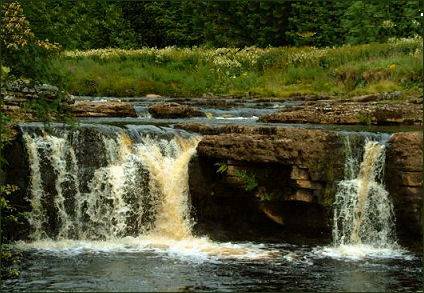 The waterfall lies about one kilometre upstream from the village of Keld. Nestling in a hollow below Kisdon, at around 1100 feet above sea level, Keld stands on the banks of the River Swale and boasts superb views of the surrounding valley and hills. The Yorkshire Dales village has three other waterfalls in its vicinity, Kisdon Force, East Gill Force and Catrake Force. The River Swale is created by the merging of the waters of Birkdale Beck and Great Sleddale Beck as they tumble off the Pennine Watershed. The waterfalls in the north of England are often known as "Forces" the name derives from the Old Norse word "Foss". Wain Wath Force means ford above the fall, 'wath' being the Anglo-Saxon word for a ford. Wain may denote that it was passable for a cart or wain. 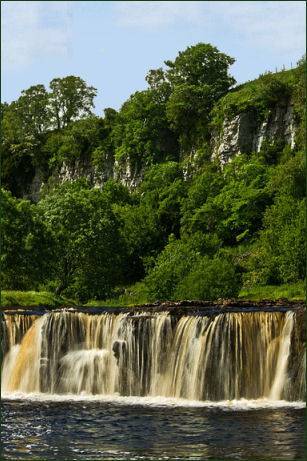 Wain Wath Force is not a substantial falls, it has a drop of only around 1.5 metres as the river flows beneath the limestone cliffs of Cotterby Scar. Despite its modest height the waterfall is a popular spot with visitors. The Coast to Coast long distance footpath passes the falls on the north bank of the River Swale while the main road up Upper Swaledale passes on the south bank.